Bohemian Mama | For the love of food!! This is a basic recipe that I use. Start off by following it as it’s written and then as you get to understand your preferences in taste and texture, you can adjust it to suit your taste buds. 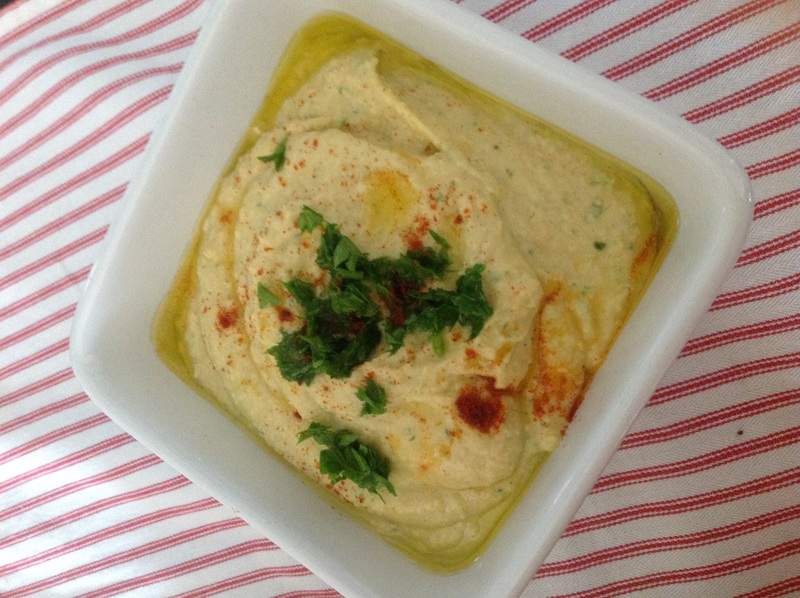 Just keep some cans of chickpeas and tahini paste in your cupboard and you will never be short of this healthy and tasty dish. 2,When the mixture is fully combined and smooth, tip it into a serving dish. Drizzle with some more extra virgin olive oil and decorate with a few whole chickpeas. Sprinkle with paprika and finely chopped coriander or parsley leaves, for colour. I like to run some parsley or coriander through the mix so I add it as I blend. Today is the 1st of January 2016. I realise that I haven’t really shopped for a week and a half, therefore leaving the fridge and cupboards a little bare. I now have little more than a Turkey carcus to work with so we have decided a curry needs to be the choice of the day. I’m excited to get the spices out and kick things up a bit. The girls however request the curry I used to make them when they were younger and that is the same curry my Mum made me when I was growing up. It’s basic, no unfamiliar ingredients but thrills my children every time. Sometimes simple Is best. So slightly with tongue in cheek I’m going to share it with you. I hope you and your children like it too. I’m not going to give you exact amounts for this is curry because it’s all about making a curry out of whatever you have in the cupboard. Keep tasting as you go along until you have your family’s favourite tasting curry. This curry has saved the day many a Monday night. Left over cooked meat… Chicken, turkey, lamb or beef cubed or thickly shedded. Fresh chopped chilli or dried add gradually to your taste. 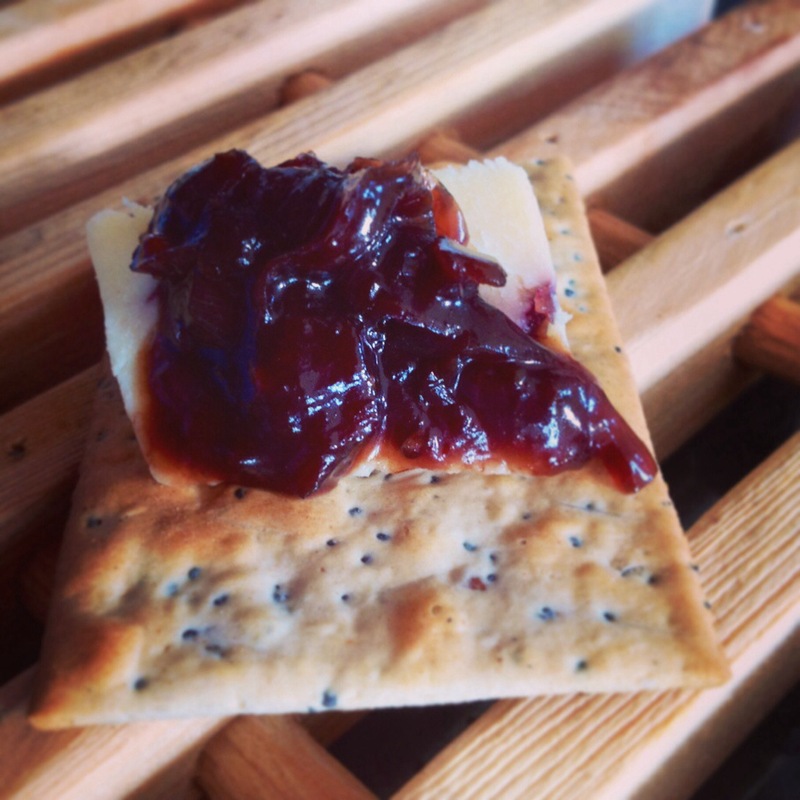 Branston pickle ( our favourite for this as is quite acidic) but any pickle or chutney will do. Take a medium sized pan and add a good splash of oil and gently fry the chopped onion until soft. Be careful not to start to colour the onion. Stir in a heaped tablespoon of medium curry powder and a dessert spoon of cornflour. Cook over a medium heat for a couple of mins then add the stock. You will need about approx a pint. You can add more or less depending on the amount you are making and how thick you like your curry. Now start building the flavour, garlic, a little chilli, large tablespoon of branston and coconut, chopped Apple, sprinkle of sultanas, squirt of tomato purée. Add your cooked meat, bring to the boil reduce the heat. Stir every now and then until the meat is piping hot, reduce heat and let the meat take up the spices until you are ready to serve. You can keep adjusting the flavours until it’s to your liking. I let the girls taste it as one likes it very spicy and the other medium so we have to reach a compromise! I like to serve this with basmati rice. Take a medium saucepan and measure in one mug of rice ( this serves three to four of us) then add two cups of cold water and a pinch of salt. Place onto the heat, when it starts to boil turn the heat down to its lowest setting, put the lid on and do not touch until all the water is absorbed. Take off the heat immediately Fluff with a fork and the rice will be perfect. Rule is 1: 2 of rice to water. I designed this recipe some years ago when Jill and I with our ‘Two Creative Cooks’ hats on taught a group of school children to cook healthier. 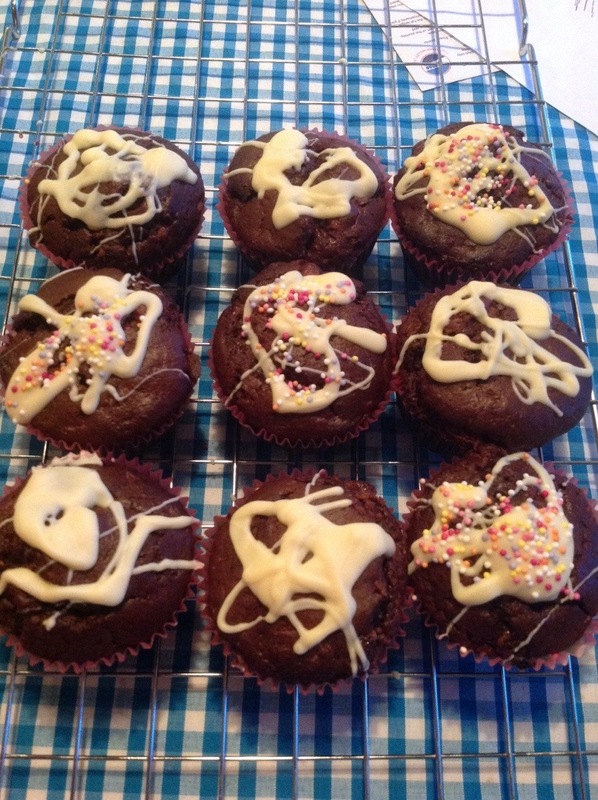 The children were totally amazed at how these muffins turned out, they simply couldn’t believe they had veg in them. My advice is to make these first without your children knowing what’s in them and then when you have them hooked, let them bake them themselves. I have written the recipe so it’s easy for children to follow. Please let me know how you get on, Happy Cooking! 1. Set the oven to 180°c/350°f/gas mark 4. 2. Separate the paper cases and put one in each whole of the muffin tins. 3. Wash and dry the courgettes, using a knife cut both ends off the courgettes. Leave the skin on, chop them finely using one of those chopper units which are great fun and get the job done quickly. Or finely grate them. Put them into a sieve and leave them to drain over the sink to remove excess water. 4. Put the eggs, oil and sugar into the bowl and beat them until creamy. 5. Sieve in the flour, cocoa powder, bicarbonate of soda and baking powder and continue to beat until well mixed. 6. Now stir in the courgettes and add the chocolate drops. 7. Spoon the mixture into the paper cases. 8. Bake for 20-30 mins until firm to the touch and smelling yummy. 9. Leave to cool in the tins for 5 mins before turning onto a wire tray. Drizzle with melted chocolate and top with strawberries that have been half dipped in white melted chocolate. 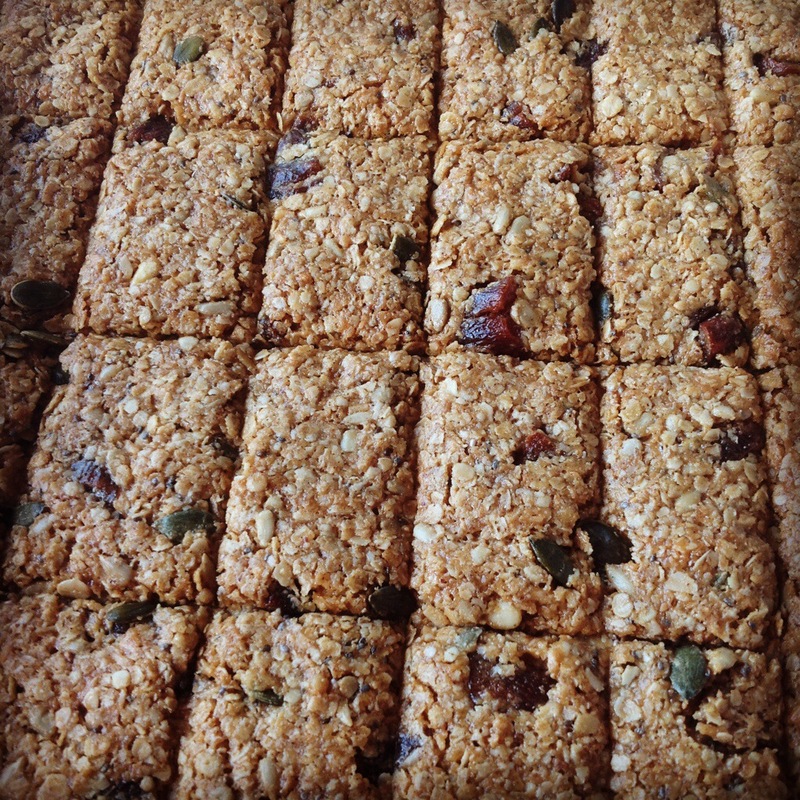 I love flapjacks because you have the chance to customise them very easily to your taste buds. This recipe mixes up the sweet with the nutritious very well. I do think you could reduce the sugar in these without compromising the flavour if you would prefer a less sweeter version. I also use a whole foods peanut butter, if you don’t like peanut butter you could use almond butter instead. I also like to add 1 tablespoon of chai seeds. 1. Preheat the oven to 160°C/fan 140°C/gas 3. Line an 18cm x 28cm Swiss roll tin with non-stick baking paper, leaving a little hanging over the edges for easy removal later. 2. Place the oats, seeds, coconut and flour in a large bowl and mix together. Melt the butter with the golden syrup in a saucepan, then mix in the sugar, chopped apricots, peanut butter and vanilla extract. Pour into the dry ingredients and mix until combined. 3. Press into the tin and bake for 20-25 minutes or until golden and slightly firm. Cool in the tin, then lift out on the paper and cut into 18 bars. This recipe is from Rachel Allen’s cookbook. 1. Peel and slice the onions finely. Place in a thick bottomed pan with the olive oil and crushed garlic. Cook over a very gentle heat for 10 minutes, making sure the onions do not colour but are soft. 2. Add the brown sugar and stir over a low heat for another 5-10mins. 3. Add all the other ingredients and simmer over a medium heat stirring every now and then this will probably take about an hour. The marmalade will be ready when most of the liquid has reduce and you are left with a sticky caramelised mixture. 4. Tip into sterilised jars and seal. Kilner jars are good for this. 5. Once opened store in fridge. This marmalade goes well with strong cheeses and makes a wonderful gift for a foodie. 1. Cream the butter and the sugar together. 2. Beat in the eggs add the Almonds and beat for two minutes. 3. Stir in the prunes (reserve three) add the chopped ginger and pour into your greased and lined tin. 4. Bake in the preheated oven for 40 minutes,then add the remaining prunes on top and cook for a further 20 minutes. 5. When cooked sprinkle the brandy on top. 6. Serve warm with whipped cream laced with brandy. Soak the prunes in the brandy overnight before making this pudding. Drain the prunes and save the brandy juice to pour over the cake when cooked. 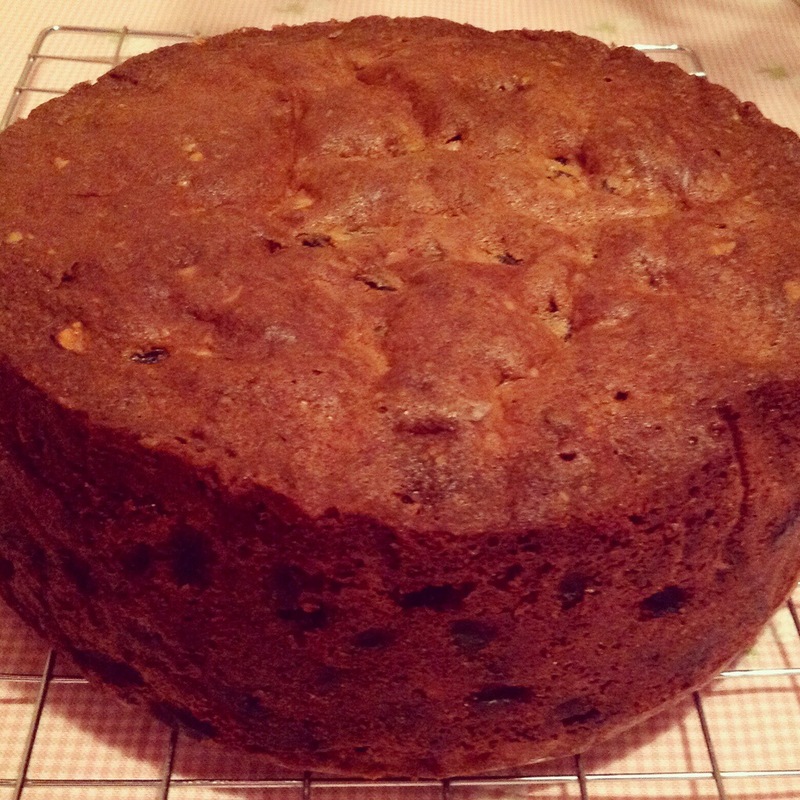 I think I first made this cake about five years ago and it has now become my family’s favourite Christmas cake. It’s fruity, fresh and totally delicious. 1. One put the raisins, sultanas, cranberries (or blueberries) and cherries in a large bowl. Add the vodka and stir well. Cover and soak for 2-3hours or even better overnight. Blend the almonds in a food processor until coarsely chopped. Tip out 75 g (3 oz) and blend the remainder until ground. Cover and set aside. 2. Grease and line the base and sides of a 20.5 cm (8″) round tin with greaseproof paper. Preheat the oven 250°C ,130°C fan, Gas Mark 2. Put the butter and sugar in a large mixing bowl, then beat with a hand-held electric whisk for 2 to 3 minutes until light and creamy. 3. Gradually whisk in the beaten eggs, adding a little of the flour if the mixture starts to curdle. Stir in the ground and chopped nuts, along with any remaining flour. Tip the soaked fruit mixture into the bowl, together with any unabsorbed vodka, and mix well. 4. Spoon the mixture into the prepared tin and level surface. Bake for 3 1/2 hours or into the skewer inserted into the centre comes out clean. 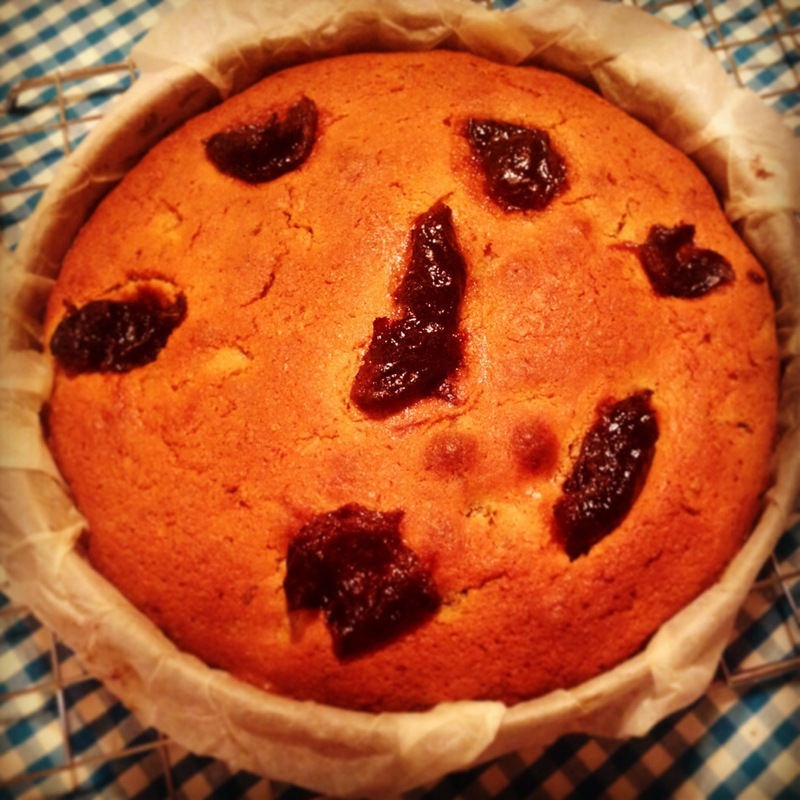 Leave the cake to cool in the tin, then remove, keeping it in the greaseproof paper. Wrap in a double thickness of foil until ready to decorate. I made this last weekend and I was really impressed. I would even go as far as saying I prefer it to a normal lemon drizzle cake. I love the bite to this and the lightness. Give it a go and let me know what you think. One heat the oven 280°C hundred and 60° fan and stuff for. Grease a 25cm round, loose bottomed cake tin. Beat the butter and sugar using a wooden spoon or electric mixer until light and fluffy. Add the ground almonds, polenta and lemon zest, and beat until combined. Add the eggs one at a time, beating well, until smooth. Transfer the mixture to the tin and spread evenly. Bake for about 45 to 50 minutes or until golden and firm to touch. Leave in the tin for a few minutes, then turn out, upside down, onto a wire rack. Prick the base all over using a skewer or a fork. 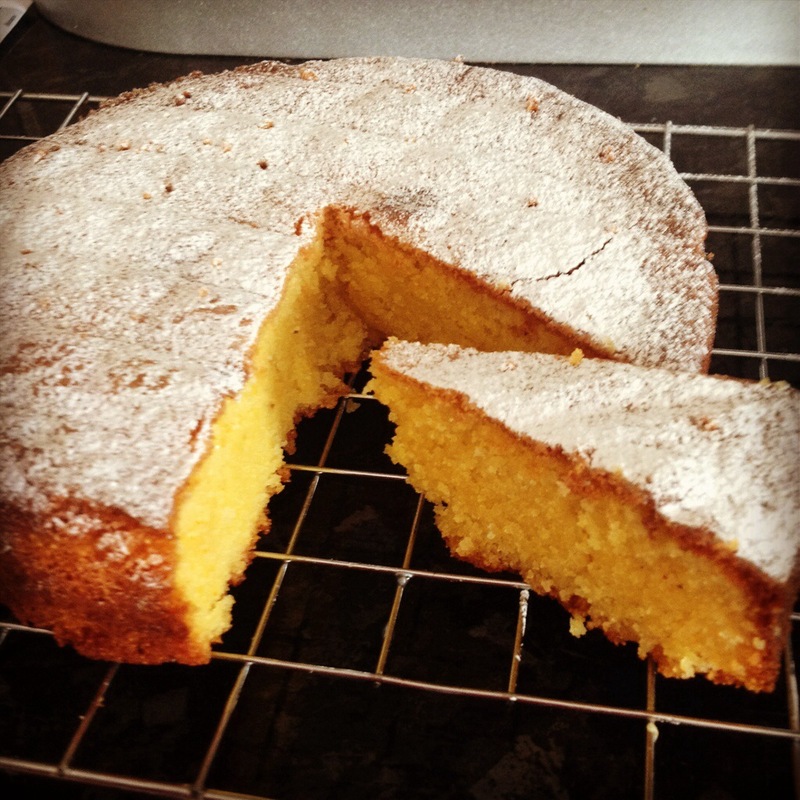 To make the syrup, heat the lemon and icing sugar until boiling, then remove from heat and spoon over the cake. Once the syrup has soaked in, you can turn the cake the right way up or leave it as it is. dust with icing sugar to make it look extra special. This is delicious served with creme fraiché, just saying! From The Clandestine Cake Club cookbook. A family favourite, best nut roast I’ve every eaten. Go on, give meat a rest and go nuts! 225grams (8 ozs) Mixed raw nuts eg: peanuts, walnuts, almonds, cashews etc. Sliced tomatoes, fresh basil and grated cheese ( mozzarella and cheddar taste good together). 2. Chop the onions and saute in the butter until transparent. 3. Grind the nuts and bread together in a liquidiser or coffee grinder until quite fine. 4. Heat the stock and yeast extract to boiling point, then combine all the ingredients together and mix well – the mixture should be fairly slack. Use slightly less liquid if you are going to put the cheesy savoury mixture in the middle. 5. Turn into a greased loaf tin. 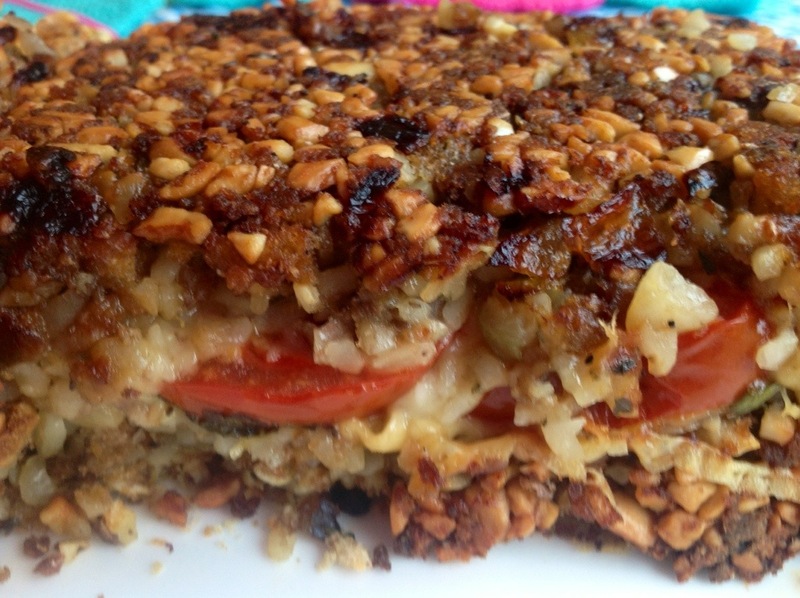 If you would like to put the cheese and tomato savoury layer in the middle, just fill tin with half the mixture and then place a layers of tomato, cheese and basil and top with the rest of the nut mixture. 6.Level the mixture off and sprinkle the top with breadcrumbs (not essential) and bake for 30 mins until golden brown. Serve hot with a tomato and basil sauce or slice up cold with a salad. Delicious. To make this extra special for Christmas, place half the mixture into the tin and then place slices of Brie and dried cranberries over and then add the rest of the nut roast mixture, absolutely delicious. Originally from Cranks whole food recipe book. This has been described as a beefed up version of a spicy potato tapas recipe. For me it’s a one pot wonder, quick, tasty and perfect for the autumn months ahead. 1. Cut chicken breasts into large pieces. 2.Cut the onions, potatoes, red pepper and tomatoes into big chunks. 3.. Cut the chorizo into smaller chunks. 4. 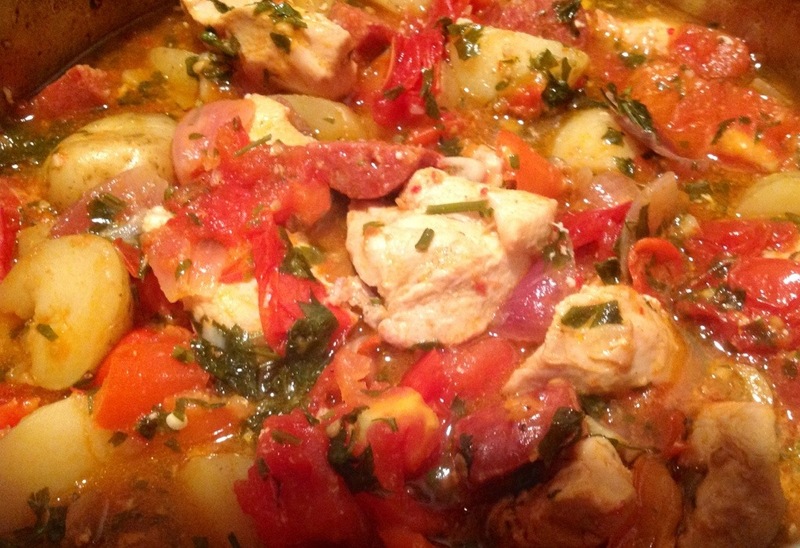 Place the chicken, potatoes, chorizo, peppers and onion into a large cookpot. Drizzle a little olive oil on them. 5. Roast in a preheated oven at 200°C/gas mark 6 for about 20 minutes, stirring every now and then to coat the ingredients with the paprika flavoured oils released from the chorizo. 6. Add tomatoes, sliced garlic, a big handful of chopped parsley, a big squeeze of lemon juice, a shake of chilli sauce and some ground or crushed black pepper. 7. Stir together well and return to the oven for about 20 minutes until the potatoes are tender. 8. Serve straight from the pot with steamed green beans. This recipe was given to me by my lovely new friend and work colleague, Suzanne.